You know the adage “it’s the thought that counts” when it comes to giving? Well, ’tis especially true in the blogopshere, where valued free gifts abound — in the form of useful content — on a regular basis. How can social media work for your brand in 2010? Maltoni is the astute mind behind the popular blog, Conversation Agent. 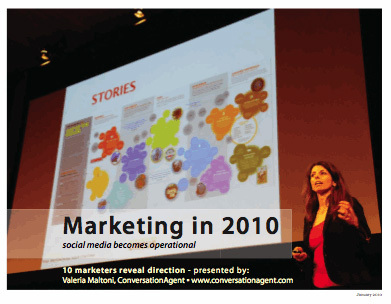 An expert in marketing communications, customer dialogue and brand management, she has lots of friends in the biz, 10 of whom contributed to Marketing in 2010: social media becomes operational (a link to download the e-book is at the end of this post). Maltoni is a deep thinker, and so are the pals she asked to ponder variables and propose directions that make social media marketing operational; such as objectives, strategies, tools/tactics, people, and measurable goals. The result is a revealing collection of well-considered insights from individuals who are all actively engaged and practice what they preach. Danny Brown — Are You Wile E. Coyote or the Roadrunner? These assorted articles explain how, in the coming year, companies must be savvier, more serious and more strategic in how they plan and execute social media programs. They assert social media marketing is no longer optional, but a must-have, to be integrated and aligned with overall business goals and objectives. 2010 is the year a clearer picture develops, such that experimental theory settles down into best practice. Along with prognostications, there are directions for how to execute best practices to ensure your social media marketing success. Each author is a prominent blogger in his/her own right and the e-book provides valuable perceptions — you’ll want to keep it on hand for reference throughout 2010. And again, to download the e-book, click on the link at the end of this post on Maltoni’s blog, Conversation Agent. Why not check out this valuable free e-book and then share your thoughts on its content? Comments welcome.